IRVINE – Caltrans put shovels in the ground today on a project that will bring much-needed improvements to a major interchange in San Juan Capistrano, while creating a new gateway to the historic downtown area. The $86 million project will replace the existing I-5/Ortega Highway interchange and increase the traffic-carrying capacity of the bridge over the freeway. “These improvements will relieve congestion at one of Orange County’s busiest traffic chokepoints, making driving much less stressful for motorists,” said Caltrans Director Malcolm Dougherty. 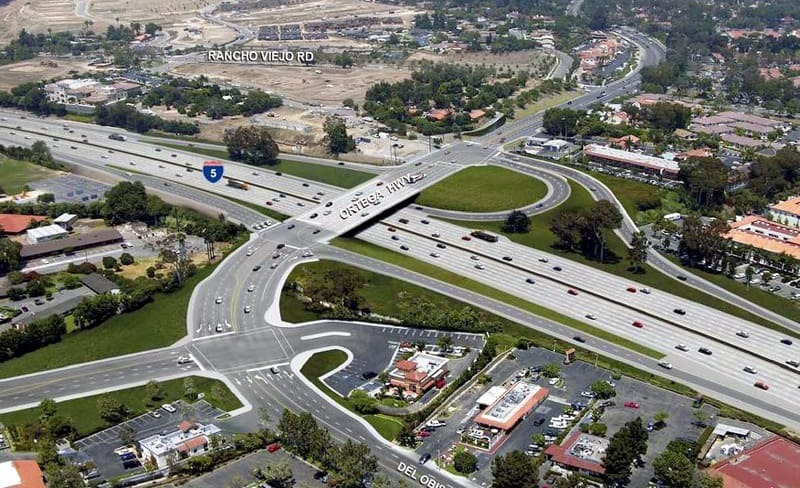 The existing on-and off-ramps at the interchange will also be widened, a new northbound I-5 on-ramp from the Ortega Highway will be built, and the highway will be realigned to reroute westbound drivers from Ortega onto Del Obispo Street. Since 2004, the average daily traffic volume at the intersection daily has risen from 71,000 to nearly 100,000. The project, which is expected to take two years to complete, is a partnership between Caltrans, the Orange County Transportation Authority (OCTA) and the city of San Juan Capistrano. It is funded by the State Transportation Improvement Program ($47 million); Proposition 1B ($31 million); OCTA’s Measure M; San Juan Capistrano ($4 million); and Orange County ($4 million). Along with the traffic benefits, more landscaping will be planted to attract visitors to historic San Juan Capistrano. For more information and to sign up to receive construction alerts, please find the project on Facebook at www.facebook.com/ortegainterchangeproject and Twitter @OrtegaHighway.